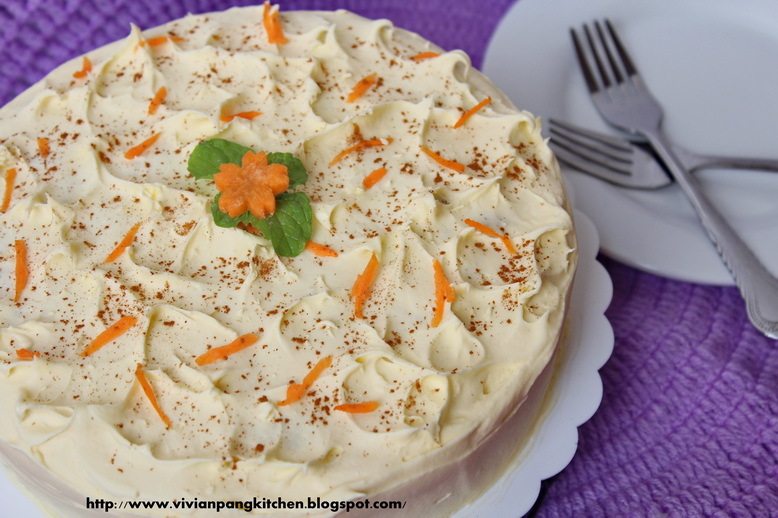 I have few carrots in fridge and was thinking to make carrot cake. I searched the carrot cake recipe in The Pioneer Woman site and found this. This is an easy recipe. All you need is get ready the ingredients, mix and bake. In order to make it healthier I replace white sugar with dark brown sugar; replace half portion of all-purpose flour with whole wheat flour. I bake half of the recipe in 7-inch baking pan. As for the icing I reduced to half as well. As usual I reduce the amount of sugar. Do adjust according to your liking. Overall the carrot cake is good provided with the cream cheese buttery icing on top :D The texture is more on muffin side with lots of shredded carrot in between. Don't you think is much more appealing with the frosting on top? 1. Preheat the oven to 180C. Mix together the sugar, oil and eggs in a large bowl. 2. In another bowl, sift together the flour, baking powder, cinnamon and salt. Add the flour mixture to the sugar mixture and combine. Then add the carrots and mix well. 3. Pour the batter into a lined (or greased and floured) pan and bake until done, about 30 minutes. Leave to cool completely. 4. For the icing: In a larger bowl, cream the butter, cream cheese and icing sugar together. Spread the icing on the completely cooled carrot cake. Decorate the cake as you like. I'm linking this post to Cook like a Star, Ree Drummond organised Zoe from Bake for Happy Kids, Yen from Eat your heart out and Mich from Piece of Cake. this is one professional looking cake! Nice frosting. What did you sprinkle onto the frosting, cinnamon? The carrot cake looks really moist! And I love the frosting, looks so fluffy! 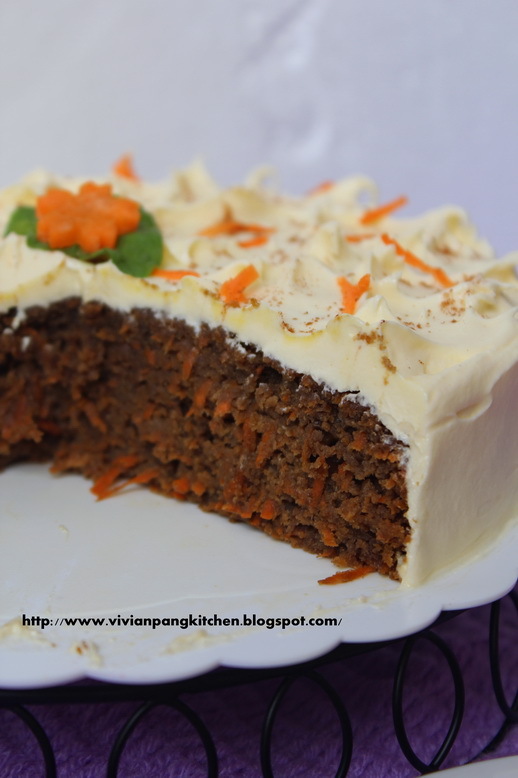 Hi Vivian, your carrot cake looks very moist and delicious! I'm always too lazy to grate the carrots, so haven't attempt making them before... haha. Hope to get around baking them soon! This looks so moist and delicious! I would love to have a few slices! When you said muffin like, it is dense? Yes, it is denser with more moist. That's why is better to eat with frosting. It was a favorite then and still is today. A carrot cake is never without the cream cheese frosting right??!! I might make my grated carrot a shorter grate if you know what I mean. Oooo that's a very dense cake. Carrot cake is best with the cream cheese frosting. YUM! 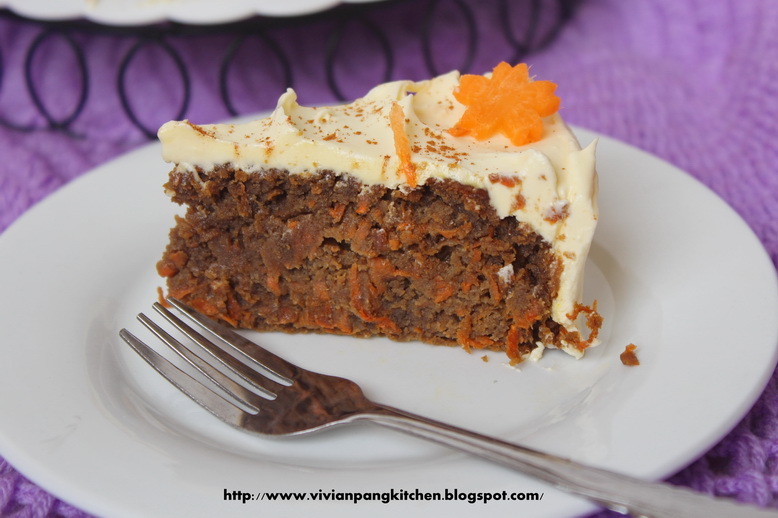 Everyone commenting your carrot cake post seems to like their carrot cake with cream cheese frosting... Me too!!! Like the fact that you have tailored this recipe very well according to your liking... Your carrot cake looks very moist and delicious! Yum! 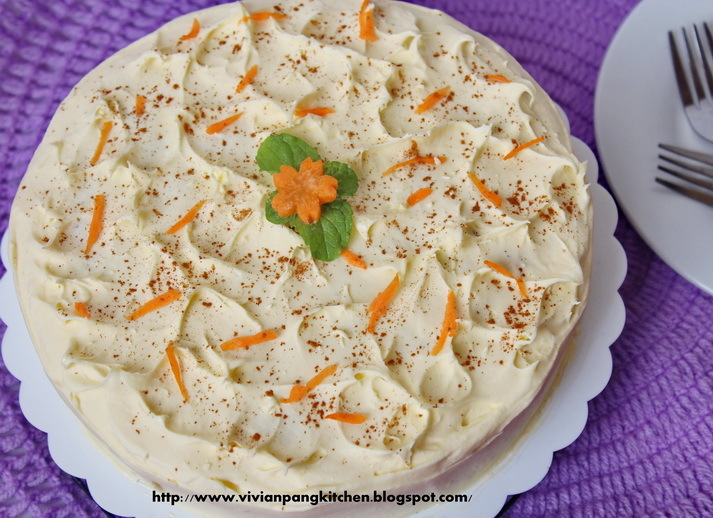 Ooh I love how good your carrot cake looks especially with that cream cheese frosting, Vivian :) It looks very moist even with your modifications of wheat flour and sugar. Nice!